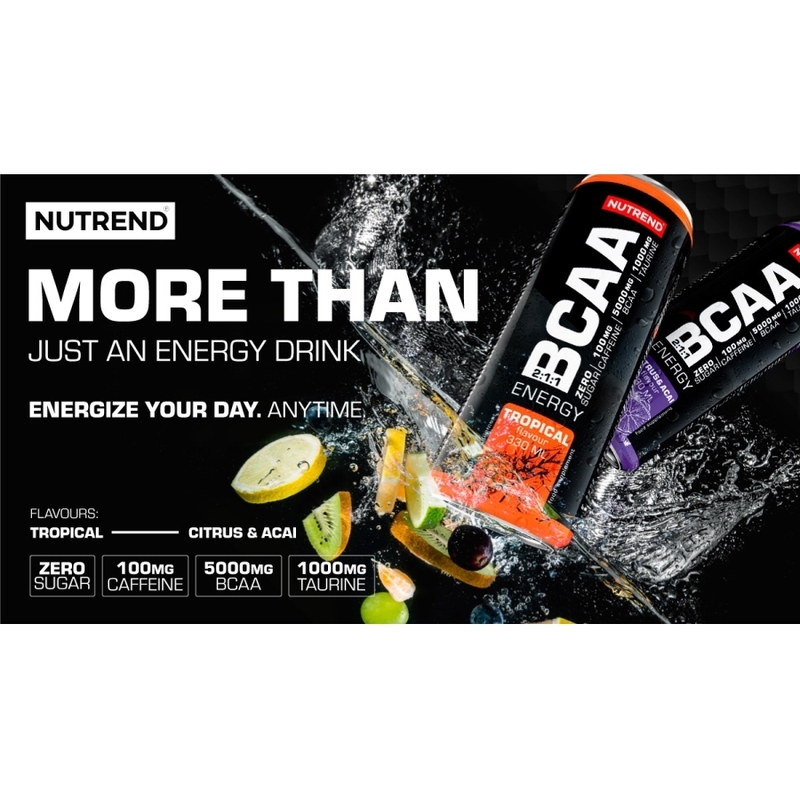 Absolutely new product from NUTREND ! This BCAA ENERGY drink will refresh you during any sports activity or in your free time. This carbonated drink is high in essential branched amino acids (BCAA) and caffeine and is absolutely sugar free! 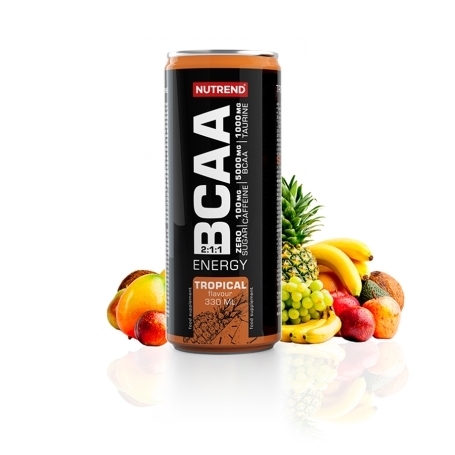 You will appreciate BCAA ENERGY whenever you need to concentrate while driving or studying and it is also good before or during activity. 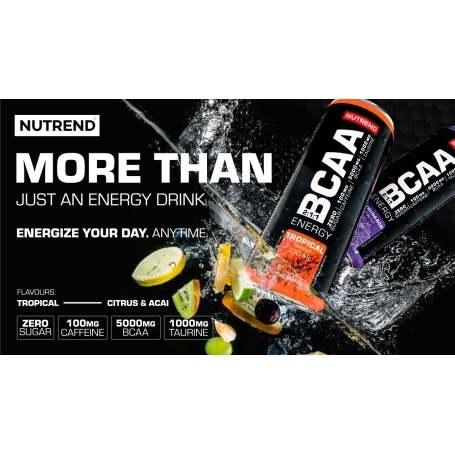 Drink is enriched with vitamins B3, B5, B6 and B12, which together with other substances support reduction of fatigue, in 2 different flavors Citrus with acai and Tropical. Recommended dosage: maximum 1 can per day, 20-30 minutes before or during physical aktivity. 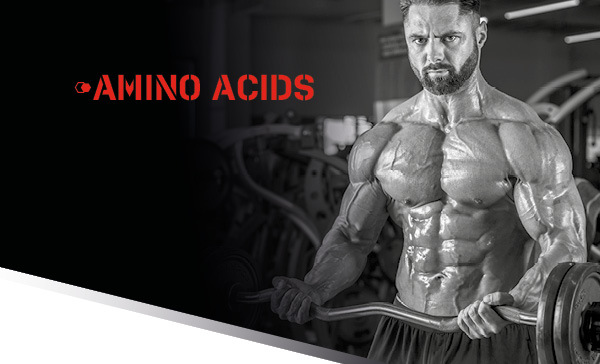 Do not exceed the recommended dosage. Use: consume immediately after opening. Warning: Food supplement, with sweeteners, contains caffeine (100 mg/330 ml) – not suitable for children and pregnant or breastfeeding women. 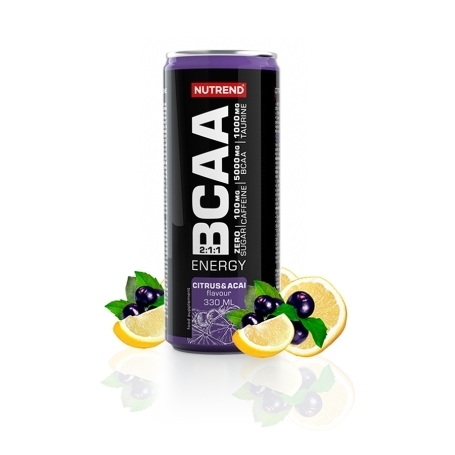 Carbonated drink without sugar, with a high BCAA content, caffeine and vitamins. Does not replace a varied diet. Keep away from children. Keep away from heat, frost, humidity and direct sunlight. 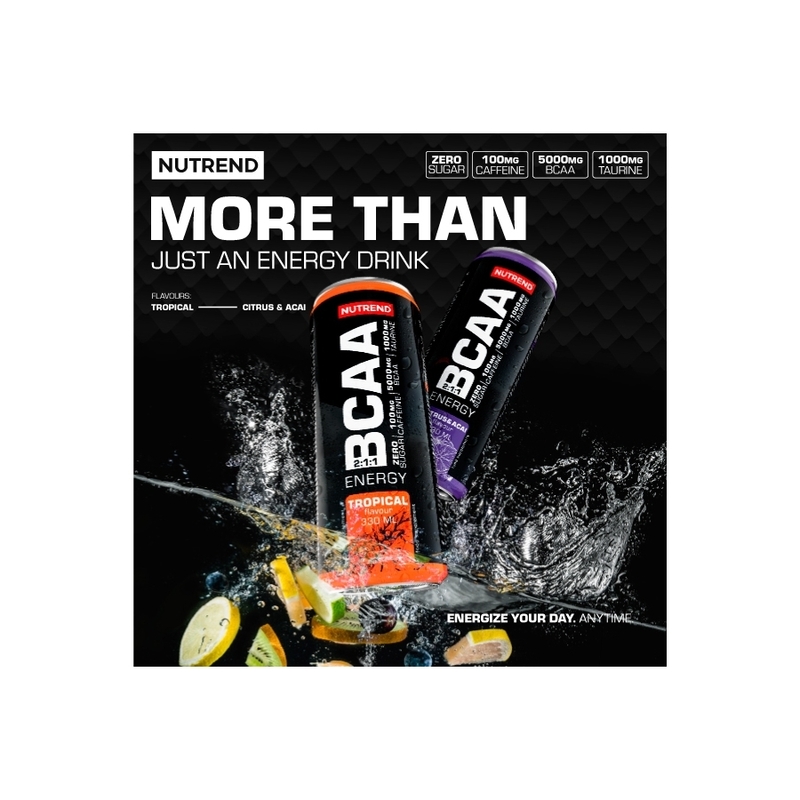 Best before: see packaging. 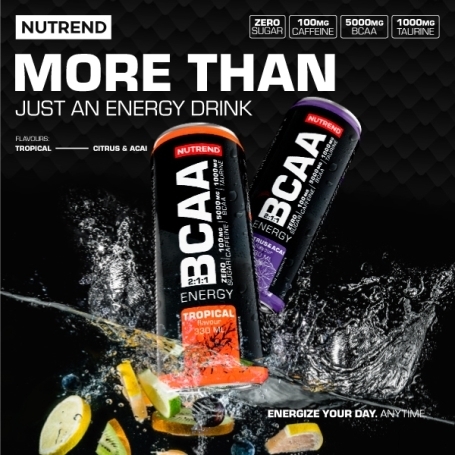 Citrus+açaí flavour: water, L-leucine, carbon dioxide, L-valine, L-isoleucine, taurine, acidity regulator citric acid, glycine, flavouring, glucuronolactone, carrot and pomegranate concentrate, acidity regulator sodium citrate, antioxidant L-ascorbic acid, sweetener sucralose, caffeine, nicotinamide, D-calcium pantothenate, pyridoxine hydrochloride, cyanocobalamin. 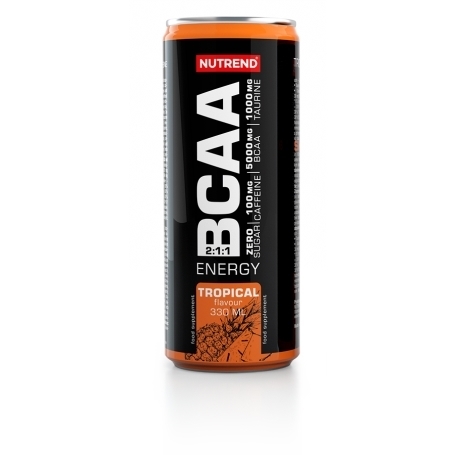 Tropical flavour: water, L-leucine, carbon dioxide, L-valine, L-isoleucine, taurine, acidity regulator citric acid, glycine, glucuronolactone, flavouring, acidity regulator sodium citrate, antioxidant L-ascorbic acid, stabilizers Arabic Gum and E 444, sweetener sucralose, caffeine, colouring beta carotene, nicotinamide, D-calcium pantothenate, pyridoxine hydrochloride, cyanocobalamin.